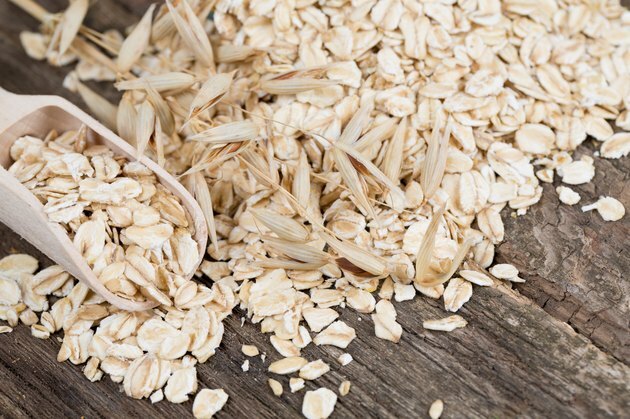 Old-fashioned oatmeal, slow-cooked for 20 minutes or longer to a smooth and creamy consistency, is a significant upgrade over a pouch of flavored instant oats. Unfortunately, many cooks can't afford to stand at the stove, stirring, for 20 minutes. But creative oatmeal lovers have found ways to use convenient appliances such as slow cookers and rice cookers to prepare fresh, hot oatmeal. The slow-cooker method requires advance planning, but you can make impromptu oatmeal in a rice cooker while you're showering and getting dressed. Check the manual or website for your brand of rice cooker. Oatmeal instructions vary from brand to brand, primarily in the quantity of liquid you need. Use the rice cooker's own measuring cup for the manufacturer's recipes, and use standard measuring cups for any other recipe. Rice cooker cups are smaller. Measure 1 cup of large-flake or steel-cut oats into your rice cooker. Add 2 to 4 cups of water, as directed by the manufacturer. You can substitute milk for all or part of the water, though you'll increase the risk of the oatmeal sticking or scorching. Add a pinch of salt. If you want to add extra ingredients such as fresh berries, raisins or spices, add them at this point. Cover the pot, and press Start. When the cycle has completed, remove the lid and stir the oatmeal. If it sticks to the bottom of your cooker or scorches in places, you'll know to stir the oatmeal at least once in future batches. Serve hot, with your choice of toppings and accompaniments. Prepare your first batch of rice cooker oatmeal at a time when you can be on hand to keep an eye on it. Cooking oatmeal bubbles up dramatically and can boil over and create a mess in your rice cooker if you're not there to supervise.